Are you a confident and take charge type of woman? Your personality is your strength so here’s how your choleric temperament benefits your whole family. This is installment 1 of 4 on the four temperaments. This week, on four separate days, I’m going to describe a mom with each of the four temperaments. My goal is to help you identify what type of personality you are born with. I’m going to describe the positives about your temperament and how it blesses your family. We often view ourselves in light of everyone else’s accomplishments, even those completely different than us, and feel discouraged. My aim is to help you identify your strengths (and later I’ll do the same for your kids’ strengths) and to begin noticing the small ways, the little ways throughout the day, that you are nurturing and caring for those around you. If today’s temperament is not your own (we still have Strong + Deliberate, Fun + Energetic, and Calm + Steady to come), think about another mother this is describing and take the time to send it to her to encourage her that she is running her race well. The Confident + Take Charge mom is based on the choleric temperament seen through the lens of motherhood. You’re extroverted, practical, and quick thinking. You are active at home and otherwise, always looking for something to do or, conversely, noticing what needs to be done. You’re the most self-confident temperament, and in large part this is due to the fact that you celebrate your successes, and see obstacles and failings as challenges. You don’t place your worth in one time events or situations so you move confidently through life. Motherhood is no different. The Confident + Take Charge mom is loyal and protective. You want the best for your little ones and do not abide anyone or anything that seems to threaten that peace and safety. You take your role as a mother seriously, and have high expectations for your family. Your visionary nature lends you to create goals, wishes, and plans for your family’s future and you work hard to bring those to fruition. When challenges arise, you are able to rise above the moment and keep your eye on the big picture. It’s why you are a natural leader. The running of the home is no problem for the Confident + Take Charge mom and her home is usually ordered and organized. You, more than any other temperament, are able to get a lot done in a short amount of time. It comes so natural to you, in fact, that you take for granted others are able to as well. You are active and energetic and provide your children with ample opportunities to explore, have fun, and learn. You see the big picture in the small things. How one lesson adds to their knowledge. How reading one book aloud brings them closer to reading on their own. How one day at a museum broadens their horizons. How one cuddling or wrestling session strengthens a relationship. The role of discipline and training in parenting comes natural to you. You were born to be in authority and are able to enact consequences and deal quickly with disciplinary issues. The emotionally mature Confident + Take Charge moms are able to consistently discipline their children while being very loving and nurturing at the same time because they know the value both of these things have on character building. You challenge your children to bring out the best in them and unlock their potential. Whether you challenge them directly (those children you know respond well to this) or you gently push them into new situations that will challenge them, you see each child individually and work to help develop their little characters and hearts with enthusiasm. The Confident + Take Charge mom quickly identifies her children’s strengths (and weaknesses) and seeks to build up their strengths through practice and repetition. She also gives her kids tools to help manage their weaknesses. Because she views the big picture (10, 15, or 20 years from now) she is able to persistently work with her child in areas they struggle with, providing both encouragement and correction when necessary. You are incensed at the thought of injustice or bullying so you speak frequently about standing up for one’s self and others. You encourage your children to speak out and stand up for what they believe in. Being Confident + Take Charge you already know your values and beliefs, and are easily able to communicate those with your kids in hopes they adopt the same values. You ask questions, encourage discussion, and earnestly desire your children to have a strong sense of self. You are a good homemaker. You’re not easily frazzled by the shenanigans of small children. You are protective and loyal like a mama bear. You want your kids to rise to their potential and you see how great they can be, even before they do. “She sets about her work vigorously; her arms are strong for her tasks…. The Confident + Take Charge Mom’s children (and husband) are likely amazed by your capacity to think, feel, and act so decisively. They count themselves blessed to have you. Leave me a comment if you know you are a choleric Strong + Confident mom! Click on the descriptions below and it’ll take you to that post. I recommend reading all 4 before you determine which temperament you are! It was hard for me to decide between two, the confident take charge mom, and the fun and energetic mom. 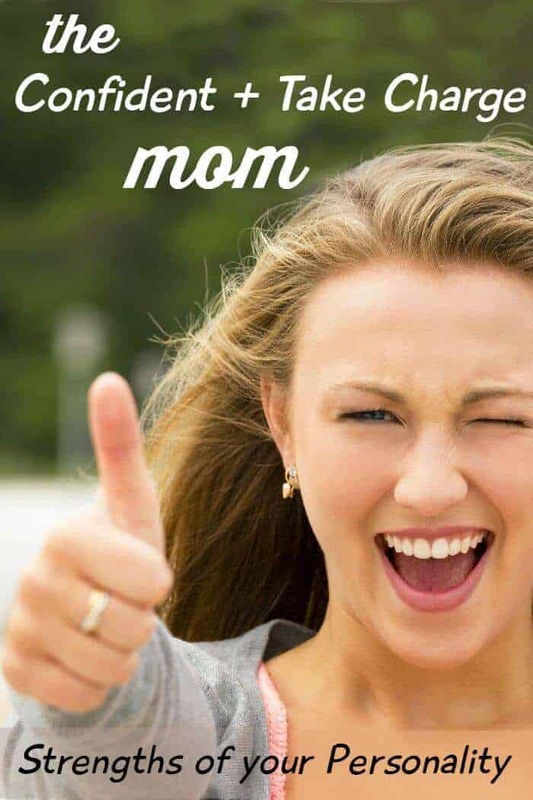 I could see strengths and similarities about myself in both descriptions, but I found that I had more in common with the confident, take charge mom. I struggle calling myself confident though. I think that is what brought me to your website in the first place. I am struggling with my self image, with how I see myself, and am in need of new tools to manage my household, but mostly my parenting with my three year old daughter. Right now I am having a hard time liking who I am and I think that is mostly because I feel lost at home, and struggle with how to get my 3 year old to listen to me, follow directions the first time, go potty without a struggle. I am in constant do this or this happens mode and it is just not any fun. We have good days and bad days. I want more good days. I am glad I have found your blog and tools and pray that I will learn more about how I can help my children succeed while providing a loving, christ centered home. Thank you for putting this together. Kaitlin, I pray that you feel more at peace with yourself. I’m telling you, motherhood can quickly spin you into an identity crisis. I know this firsthand! Even as I type I saw someone singing on TV that I saw in concert 12 years ago and I thought… wow… I can barely remember who I was! But I pray you’d feel encouraged and be able to meet some of your day to day goals so you feel more at peace! Oh my goodness, most of this is me. Except the “You are a good homemaker” – I despise cleaning and try to avoid it at all costs. But then because I long to be organized, I just feel guilty. C’est la vie. Hahah! I don’t actually “like” cleaning either, I just like having a well kept home. This was interesting, but i have come to the conclusion that i am the strong and confident mum. I am also a bit of the fun and energetic, but this rings true. :-) the only exception i would have is in regards to housework, because i like things organised and tidy, it often gets put by the wayside…cause i am always trying to invest in people. Plus i am a single mum, study fulltime and work a little as well! I know this is my temperament, but I struggle with keeping up the energy to “do it all.” And that’s when I argue with my husband, who is the Type B to my my Type A. There are many positives to being a take charge & confident type of Mom, but it isn’t easy! I’d love some tips on how to focus on the moment, rather than all there is to do to keep things on track. Or maybe tips on keeping things on track more easily, so there’s time for focusing on the moment! Jeanette, girl you are not alone. I’m reading a book now called “Margin” and it’s perfect for me and you with this temperament. I think we often use all that energy up and don’t have it left for the things that matter most to us. And our husbands don’t get it because they’re like “Just relax” and we’re like “oh, yeah, THAT’S good advice.” Haha. Great idea for a post, though. What helps with me is this analogy: instead of seeing life like a video (although that’s good to do too), see the moments you want to live in the moment in, like a photo. Your website is ace! And I am not simply referring to aesthetics, the content is different, it calls out to me. I THINK this is the personality description that matches mine best. I suppose we might all have a trace of the other personalities too but this is the one that best covered my traits. My three year old has really contributed to getting to know my own self better, discover my limits, challenge them and strive to improve. This is my daily challenge… spending good days with my daughter, creating harmony in the household, keeping her entertained and providing her with situations to learn. Not saying it’s easy, far fromit, but it is a wonderful journey when you look at the greater picture, for the whole family. Becca, sounds like you are enjoying the best of your personality and improving on the weaknesses. Best case scneario! I definitely feel that this is my personality. I strive to be the “perfect” mom but fail constantly. The pressure to “do it all” and still have energy to focus on the family at the end of the day is completely exhausting. I am married and have a 3 and 1 year old and struggle to keep it all together for everyone while remembering I matter as well. Praying this boot camp will help me remember to focus on the present with my family instead of constantly thinking and worrying about what needs to be done in the household. Deanna, I am the same personality and the struggle is real. This is my first time ever!! Leaving a comment on an article. But i have to say, THANK YOU rachel, for this. I never ever thought that my ” take charge mom” personnality was any good to my children. As my eldest always complains about me being to tough, and not playing enough with him. I am a stay at home, homeschooler, i have a gifted hyper sensitive 7yo son and a 15 late bloomer sweet daughter. I am married with a very busy husband, who leave me in charge of everything!! I feel like an army general setting up her troops for a battle.!! And i have to thank YOU for that. I can’t wait for the rest of the training to learn more tips. Oh and in case i made spelling mistakes, just note that i am tired. ok? Now with norwegian airlines it’s cheap and easy to come to martinique. Thank you! This is something I’ve been needing. As a choleric (ENTJ), I’m constantly feeling pulled to keep myself busy and it’s a daily struggle to not lose patience with the complete incompetence and emotional fragility of small children (I am blessed with 5, 3 and 1 right now). I love them to death and do not fault them for behaving like children– but I do fault myself for being too strict or not making time to play. I wonder why I can’t be content like other moms, even though I know I’m very blessed to be home with the kids, it’s a real challenge. I always read about the negative aspects of my personality type and that’s just not helpful when you’re trying to improve! So thank you. I will sit and pray with this passage. And thanks for letting us all vent! Christina, I am choleric ENTJ as well so you are saying exactly how I feel. I know it too too well! Thank you for pointing out the pluses of this “Type A” personality of mine! I spend a lot of time focused on the negatives that it is healthy to see there is a positive too. (I know there is, it is just not where I’m focused when it comes to myself). That’s exactly what so many of us do! Glad you can see some positives, it was hard for me as well. Confident-Take Charge without a doubt. I’m basically this mom, but I’m an introvert. Thanks Rachel for writing some posts about all mothers having strengths. Some days I feel like I’m failing so bad. It’s good to be reminded that we aren’t doing everything wrong even if it feels that way somedays. Oh I TOTALLY get it! Your blog has been such a blessing for me. Thank you for finding the time to raise your family and inspire all of us Mom’s out here. You have a gift and I thank you for sharing. Yes, this is me but with a lot of the social landscape of the fun/energetic. Did not see myself being this one but I figure all or most single moms must be. Confident-Take Charge, without a doubt. Although i do have the ‘researcher’ part of Strong & Deliberate mum, and can get melancholic too. Classic example, today. I have a 3, 2 and 5 week old (the first 2 irish twins!) and i was late picking up the 3 year old from preschool because i had to breastfeed and they want to fine me for being 3 minutes late! money aside, i got upset and started crying in front of the teachers, and wondered was it my sleep deprivation, hormones running wild still from just delivering a baby, but then i realised it was because i felt like i let down my son and they told us we may want to consider another option. I felt my son and i were being rejected and it was the first occassion! Thank you God for speaking to me through Proverbs, and thank you for being a vessel of the Holy Spirit Rachel. It was exactly what i needed to read today. May God please teach us all to learn to live with our weaknesses and learn to rely on him…i’d also really like to learn how to live in the moment..and enjoy it..better!